Just getting to the right Stetten for genealogist Virginia Packwood was a challenge. 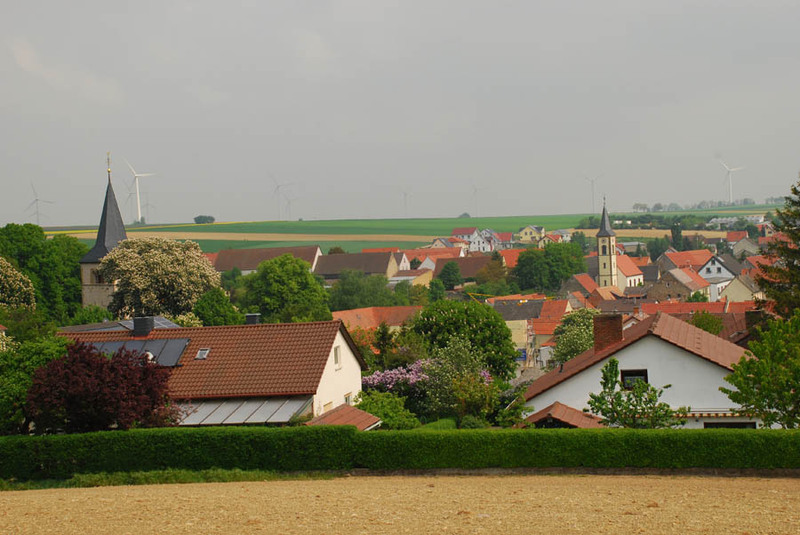 There are more than 20 villages in Germany with the name of “Stetten,” and finding the correct one related to her Merkel ancestry took some time and work, not to mention a couple of decades when she and her husband Bill were busy with careers in education and raising three boys. Finally, after years of waiting and planning, on the bright and sunny spring morning of April 26, Gini and Bill walked through Stetten for the first time. 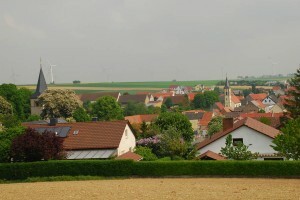 The village nestles against the side of a hill, with the mass of the Donnersberg (Thunder Mountain) visible to the southwest. The village is laid out along the Hauptstrasse (Main Street) plus a handful of cross streets which climb the hills on either end of town. The Catholic Church occupies a high point at the west end of the village. Farmers live in the village and commute out to their fields. This is the way it has been for hundreds of years, and the way it is today. Horses graze right across the street from modern bungalows. We walked around the village on that April day, taking photos and meeting a few of the residents (including one who was apologetic that she could not invite us inside, but she “had her hands deep into the dough and the bread was rising”). The real heart-pounding excitement of our experience in Stetten came on Wednesday, April 27. We arrived in the village 45 minutes ahead of our appointment with the village mayor, who was to show us the church, to take advantage of the sunlight and to photograph a house where Johann (John) Merkel ancestor had lived prior to his emigration in 1844. While wandering the quiet “Steigstrasse,” our obvious English was overheard by a resident of a house right next to where Johann Merkel had lived. Frau Probst (In Germany, a person has a first name, and that’s either “Frau” or “Herr” (Mrs. or Mr. and you don’t get to the personal name until much, much later in your relationship – and sometimes never) came out to say “Hello! Can I help you?” She’s fully Americanized, having traveled in the northeastern part of the United States with her husband. We chatted out on the sunny street for a few minutes until it was time to meet the village mayor. 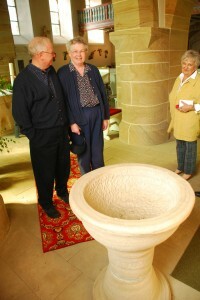 More about our visit with the Probst family later, after the church. 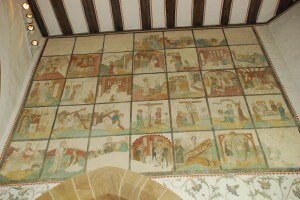 Frescoes showing scenes from the life of Jesus Christ painted in 1430, covered over in 1685 and rediscovered in 1959 fill one of the walls of the Gothic section of the church. We were greeted at the church by the mayor, Kai-Uwe Angermayer, who presented Gini with a booklet published on the birthday of the village last year and a bottle of local wine. Then we stepped back into history. The church of Corpus Christi has a history which goes back to the year 1135, when the tower was built in a Romanesque style. Gargoyles, the face of the devil and Adam and Eve decorate the sides of the tower, painstakingly and at great expense restored just a year ago in time for the village’s 1,250th birthday celebration. The organist, Frau Henn, took us through the church on a slow-paced tour which included thorough explanations of all of the statues, paintings and parts of the church from the Romanesque through the Gothic to the Baroque. We saw where the church had begun as a small chapel in the 1100s, been expanded into a church in the 1300s, and where it had been destroyed in the 1600s during the 30-years war. We saw there after more than half a century of sitting in ruins it was rebuilt with a Baroque section joining the two much older sections in a harmonious trio of building styles. Amazing indeed it was to see statues and figures, frescoes and most importantly, a 14th century sandstone baptismal font which was used to baptize every single one of Gini’s ancestor’s John Merkel’s 12 children. Posted in Europe Tours, Family History Tours and tagged church of corpus christi, genealogy, pfalz, rheinland, stetten. Hello! I’m also on a genealogical journey, seeking my grandmother’s family “Stettler” that immigrated to the US in 1732. Other family research leads me to this region as William Penn reportedly recruited this family to escape the poverty of the region. Is there any opportunity to find former residents from this and the preceding time period? Many thanks!